The Lamborghini Miura as good as defines the classic supercar. Visually, its sweeps and curves are in all the right places. And technically, its power output is this side of 'manageable'. But, thankfully, only just this side! Aesthetically, the Miura had a strong pedigree. It was a product of Nuccio Bertone's legendary design house. Specifically, the work of a young Marcello Gandini. Even at that early stage in his career, he was the pick of Bertone's stylists. While the 'eye-shadow' around the pop-up lights is a bit kitsch, the bodywork lines flow freely. Certainly, the Miura mesmerised onlookers at the 1966 Geneva Show. As was only to be expected - for a car named after a Spanish fighting bull - the Miura's muscular beauty demanded respect! A 4-litre V12 engine pushed out 350bhp. It was installed sideways-on, behind the seats - thereby reducing the wheelbase, and optimising the car's centre of gravity. That all helped the high-speed handling. The Miura was a resounding sales success - reflecting the fact that it performed well in most departments. 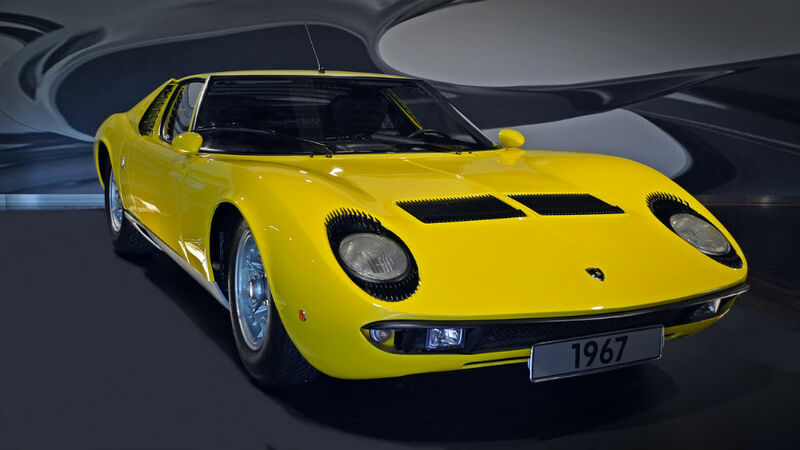 The Lamborghini Miura, then, was both user-friendly and refined ... well, apart from the eye-lashes!